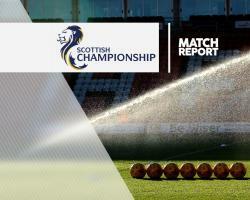 Kudus Oyenuga headed a late winner as Morton won 1-0 at Falkirk and moved level on points with their second-placed hosts in the Scottish Championship. Substitute striker Oyenuga, a second-half replacement for Lawrence Shankland, struck the only goal late on to halt Falkirk's nine-game unbeaten league run. Shankland, plus Falkirk pair Peter Grant and John Baird, were all off target when well placed in the early stages of a goalless first half. Visiting goalkeeper Derek Gaston comfortably held Fraser Aird's shot and then Grant's header after Morton defender Thomas O'Ware had blazed over the crossbar as both sides struggled to carve out clear-cut scoring chances. Shankland headed just wide early in the second period before team-mate Ross Forbes' free-kick was superbly saved by Falkirk goalkeeper Danny Rogers. As the game headed towards the closing stages, Oyenuga broke the deadlock when he headed home Aidan Nesbitt's cross in the 79th minute. Falkirk almost hit back immediately but Nathan Austin's header hit a post and the visitors held on.